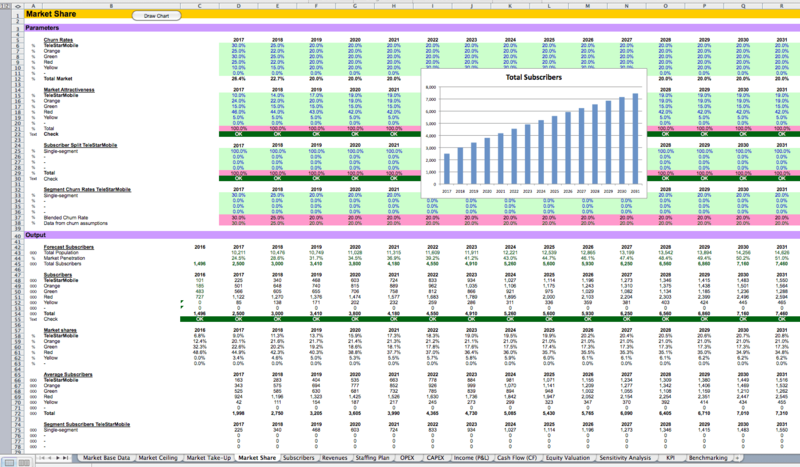 Investaura are pleased to provide exclusive access to its ‘Business Plan for Telecom’ template in Excel. The template has been used in numerous assignments worldwide. The template also comes populated with representative (but dummy) data, showing what the typical benchmarks in industry are. Over the years, Investaura consultants have come across countless business plans, prepared by others, that are much too detailed, resulting in inflexible and overcrowded templates. More often than not, rather than focusing on the “Important factors with big impact”, business plans prepared by others focus on the “Less important factors with low impact”. No surprise that these templates are difficult to maintain and have limited strategic value. Another reason why there are so many bad business plan templates is that some people confuse Business Planning, a 5-10 year forecasting exercise, with Budgeting, a 12 month forecasting effort. You don’t forecast the long term the same way that you forecast the short term, and the short term details have little relevance to the long-term view. A third issue is that in Telecoms, forecasting costs can be tricky, but is entirely feasible, even in the long term. On the other hand Forecasting demand and revenues, in the short, medium, and long term, is much more difficult to do well. While it may seem comforting to capture costs in a very fine and detailed manner, both on the Opex and Capex side, ultimately the business plan financial results (EBIT, PAT, Cashflow) and Valuation are driven much more by the ‘demand’ side than the ‘supply’ side. So business plans should put the focus on the former rather than the latter. Finally, a business plan is an integrative document. It takes its inputs from many sources. However, to remain manageable, it needs to accept that the nitty gritty modelling and forecasting of some topics are best done outside the business plan. If you accept this idea, then you gain enormously in flexibility. You free up your business plan and can now focus on issues that matters to shareholders, providers of finance, and the board. While your business plan remains in the ‘semi-weight’ category, you can add THE additional details that your board is asking you to capture as well, whether that be ‘Network sharing’, or ‘Outsourcing’, or ‘4G’, or ‘Mobile banking’, or anything else that is most relevant to the recipient of the business plan, today. The template is comprehensive: it includes a full P&L, Balance Sheet and Cashflow statement, as well as a Valuation sheet, using DCF and Multiples. The template puts its emphasis on the ‘demand’ side and market sizing in particular. For example, it includes an ‘affordability’ model. The costs side (Opex, Capex) is not neglected either, in particular multiple approaches can be used to forecast Capex, using $ per sub benchmarks or alternatively modelling the costs at the equipment level (BTS, TRX, Site costs, BSC, Core, IT etc). The template is dynamic, with the demand and supply side being integrated together. For example, network costs take subscriber and traffic into account as well. The template includes sensitivity analysis. And that’s important because you should have a base case based on robust assumptions, but also understand the impact on the key business plan results of changing your base case assumptions. The template is detailed enough to make it highly valuable, while remaining ‘light’ enough so that you don’t need a PhD in Excel modelling to add whatever additional element your CxOs are asking you to add. and to perform the sensitivity analysis. This content is for Business Plan Advanced members only.